If you use Moodle as your VLE (Virtual Learning Environment) of choice you’re not alone. The latest statistics from the Moodle community site are impressive: over 1 million teachers and over 68 million students in 232 countries use it. Whether you are thinking of dipping your toes in the waters of VLEs, or whether you are already confidently swimming around in Moodle, you may find the Moodle tutorial videos below helpful. The tutorials are for the latest stable version of Moodle (version 2.2) and are narrated by Moodle trainer extraordinaire Andrei Tarassov. 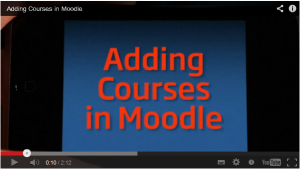 Click on each video image to go to the Moodle tutorial page. We hope you find them useful! We are adding new tutorials regularly to this page, so keep your eye on it. You can also subscribe to our You Tube channel. I blogged about the five most fabulous Moodle 2 features (imho) a while back. What about you? If you already use of Moodle, what do you think of it? Let me know in the Comments!